A low fat veggie quiche version that still packs in the flavor. Pre-heat oven to 375° F (200° C). Par cook brocolli by steaming. Spray 9" pie plate and spread cooked brocolli in bottom. In large bowl combine remaining ingredients stirring with a whisk until well blended. Pour egg custard mixture over brocolli and cheese. Bake in pre-heated oven for 35 minutes until firm. 1119 members have added this recipe to their cookbook. I loved this dish! Quick and easy and very flavourful. A definite winner! holy WOW this is SOOO good!!! Even my husband liked it!! 5 stars!! Good. I used a muffin tin to make individual quiches - make sure to grease the pan really well or the eggs stick. I doubled the recipe, used fat free half and half, and regular cheese instead of low fat. The cayenne pepper gives it nice kick. It would probably be really good with pepper jack cheese. Great for a quick breakfast. This was very good! I added bacon and mushrooms to the recipe and my Fiance was very happy. This will become a weekend favorite long after the diet ends! this looks so nice! will make this tomorow and tell you how it was! 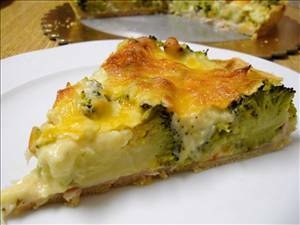 There are 157 calories in 1 serving of Crustless Broccoli Quiche. Calorie break-down: 42% fat, 18% carbs, 40% protein.